So, where did I leave off with the family room? I believe I showed you the new can lights, and that is about it. Well, let me give you the full tour. One good thing about taking a two month blog break is that when I come back you can see before and after all at once, right? No dragging things out for weeks around here! 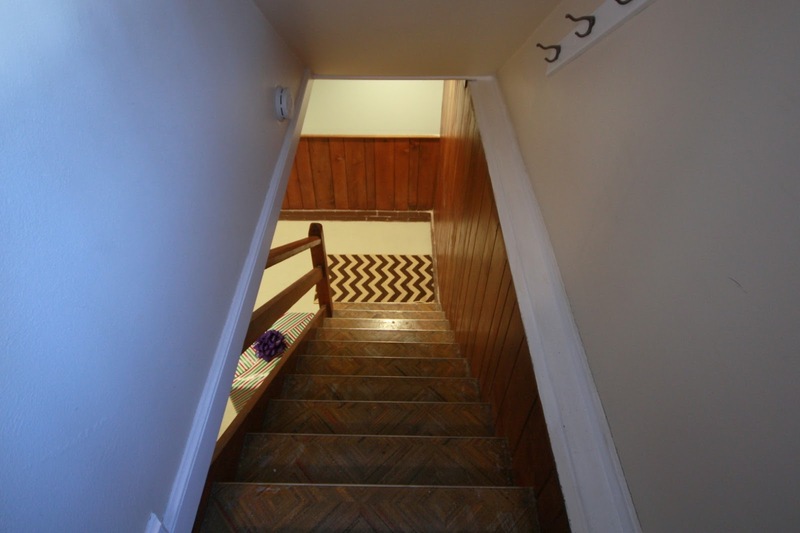 Here is the basement when we bought the house. Gross. A previous owner ran a business as a lawyer out of this room, I don't think I would've hired him after meeting here. The stairs coming down. Forgive me, I have no idea what I was doing with this camera angle. I must have been high on outdoor carpet glue. This lovely wood all used to be painted an awful green, you can still see the color in the nail holes - thankfully someone before us refinished it all! 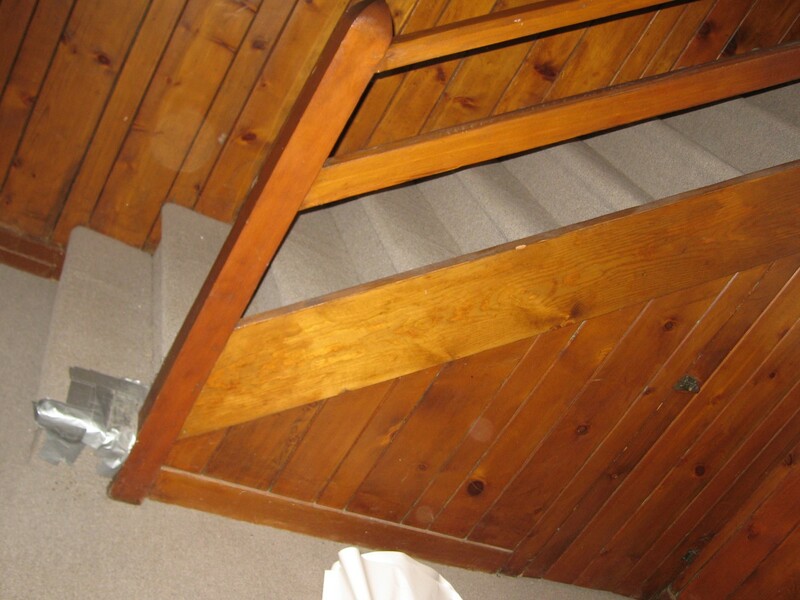 Here is when we ripped out the stanky carpet and crapped up the basement with junk. It stayed like this for years. Then we ripped all the weird walls down, we still have no idea what sort of material they were made of. 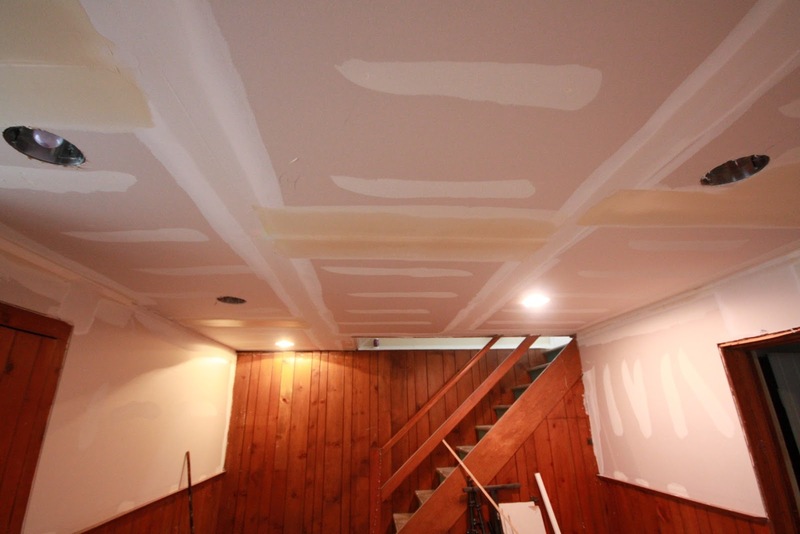 And of course, the ceiling came out - a layer of drywall covered with a layer of thick tiles. Our awesome electrician put in the can lights. We found a fabulous drywall guy on Craigslist who put up all the sheetrock for $500. And we had to do none work ourselves, he used all the existing 'studs' even though they didn't seem useable. Shows what we know, we should've done this project years ago. Then I finally got to paint! We used Glidden's Ceiling Paint on the ceiling and walls (no primer, on the advice of our drywall guy) and it sucked. The 'white' paint looked GRAY. Do not buy Glidden white! The walls were painted Behr Harbor Sky to give it a little color. The fireplace bricks were repainted in Behr Ultra Pure White in satin. We added trim to the doorways and crown molding across the fireplace wall. 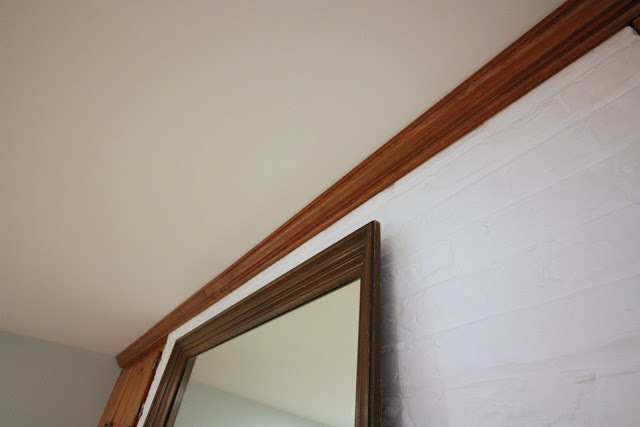 I just bought cheap pine trim and used a couple different stains until it matched up pretty well. 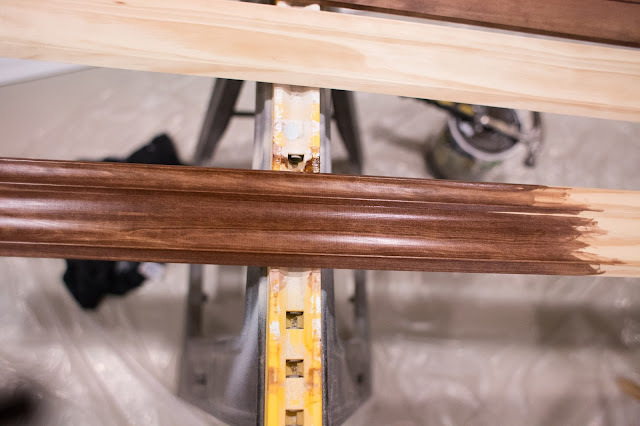 American Walnut topped with Gunstock was the magic combo. I'm happy with it! We also cleaned up the gross windows/wells and I hung curtains on tension rods since regular rods wouldn't work. Here is the finished room! I used my beloved Howard products on all the wood, and it looks great. Don't you love my mom's trippy settee and chair? They are sweet antiques on loan because we don't have any furniture for this room. Except the bookcases that used to house my clothes in the dressing room...oh yes, many things have happened in the last two months! More to come on my beloved dressing room later. 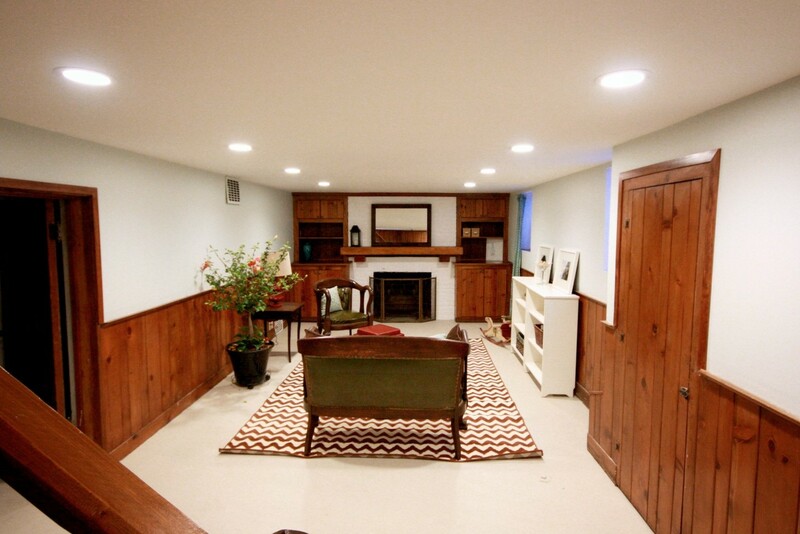 I love that this basement already had ceilings over 7 feet, so it doesn't feel like a man cave. If we put legit flooring in here, it would be perfect. BTW, that rug is also from Overstock and it has yet to lay flat after a month of being down. Oh well. uuuum, holy crap that's awesome! LOVE the sofa with the rug and just adore the space and the wood and white mix! Oh my god that looks GREAT! Good job. And you have no idea how excited I was to click to your blog when I saw the title of this post. 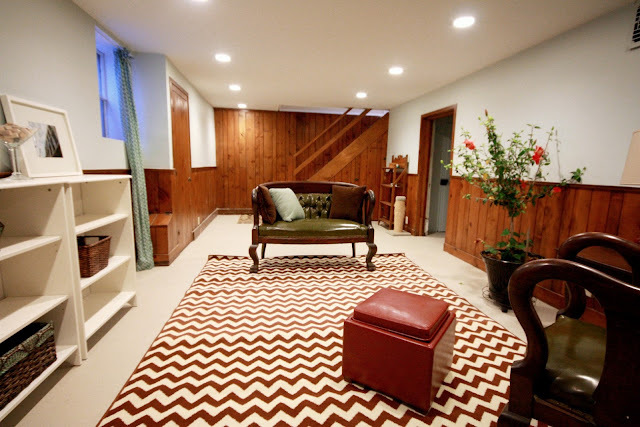 The basement looks awesome! SO MUCH BETTER!!!!! You guys are crazy productive. How's Ashford?? Amazing transformation ... tons of extra space. Nice to see you back. The space turned out great and proves you don't need to tear every little thing out to get a lovely space. Hey try leaving some heavy book on the parts of the rug that are sticking up. Leave them on for a day or so and that should do the trick! 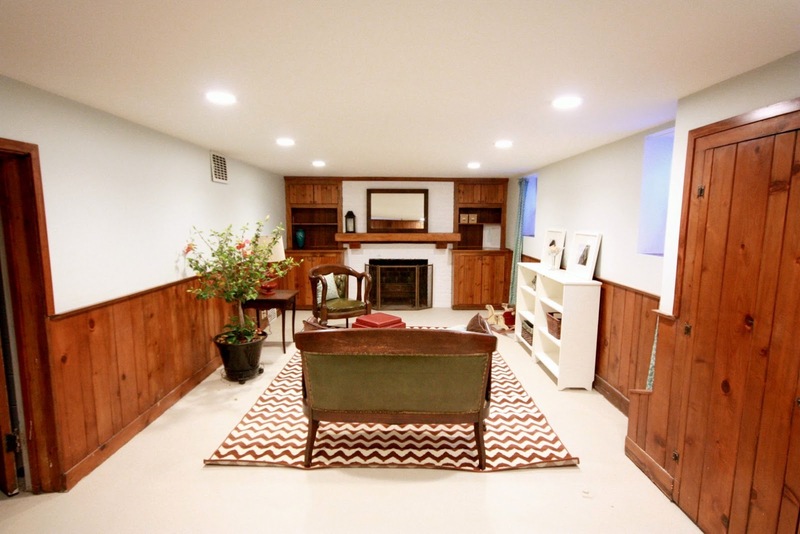 You're Basement looks great, it really makes me want to finish mine! Looks great...good to see you again. Looking forward to next pics of Ashford! The dressing room? IS GONE? This is looking great. The wood looks like new and it's so bright. It truly doesn't even look like the same space. 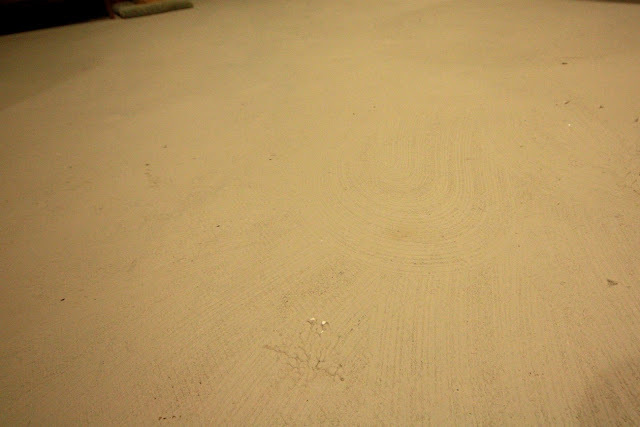 We painted our concrete floors in the basement when we moved and it was such a difference. And, okay. You need to email me. Feels like it's been forever. We need to catch up. You guys are the best! I'm so glad to be back. Very cute! Very cheery and bright. It looks awesome! So bright! I always love your renovations! This is amazing and such a transformation!! !